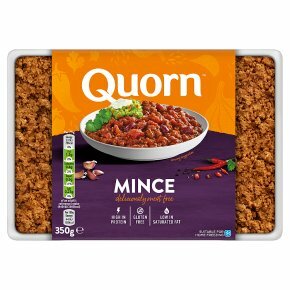 Meat free mince, made with Mycoprotein? Quorn? Mince is really convenient so you can cook differently with it. Simply heat your sauce (approx. 500g) then add Quorn? Mince (350g). Stir, cover and simmer for 8 minutes. Stir occasionally. 9 MinPlace Quorn? Mince (350g) in a microwavable dish. Add sauce (approx. 500g), stir, cover with film, pierce and cook at 800w. Stir halfway through cooking. Allow to stand for 1 minute.